Shopping malls often open their doors early for walkers and it's a common sight to see people circling the mall on foot before the stores open. Some malls even have walking clubs with perks such as discounts, and some have walking groups or clubs. 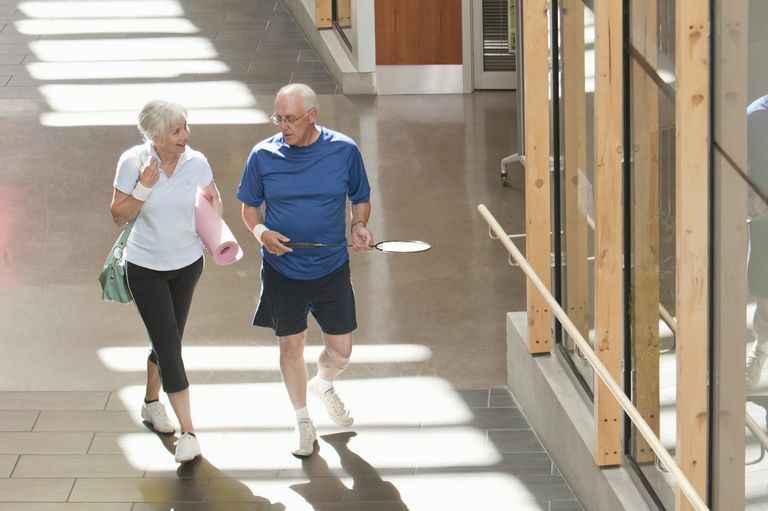 Learn about the benefits of mall walking and how to make the most of this form of exercise. It may be the type of walking for you. There are many reasons why a shopping mall is a great place to take your healthy walk. Out of the weather: Inside a climate-controlled mall, walkers can dress comfortably and not worry about wind, rain, snow, ice, or heat. As long as you can get to the mall, you can walk in comfort. Safely away from traffic: Inside the mall, you don't have to worry about dodging cars. There are no intersections to cross, no broken glass or bushes obstructing the path, no auto fumes or rush hour traffic. It's a safer walking workout location. Security: Mall security and surveillance video help ensure you won't become a victim of street crime. If you walk alone but don't feel safe outdoors, the mall is a good option. Medical response: If you have an accident or medical emergency, you will be seen by other walkers and mall staff and get medical assistance. This is an important advantage for those with a chronic medical condition or health risks. Restrooms and water: These essentials are always nearby in the mall. Cafes and snacks: You can enjoy coffee and breakfast snacks at mall cafes before or after your walk, still safely inside and out of the weather. Camaraderie: If you become a regular mall walker, you are likely to start making nodding acquaintances or friends of the other mall walkers. Go your own pace: There is no pressure to go faster or slower when you are mall walking. Mall walking is welcoming for people of all abilities. Mall walking isn't always the first choice due to these factors. Endless loops: Monotony is one drawback to mall walking. Even in a larger mall, you will circle it many times in a typical 30-minute or 60-minute walk. Your loops will pass the same (closed) stores. Hard walking surface: The floor surface is usually very hard—often it is made of concrete. You might consider wearing shoes with more cushioning to lessen the impact. Slow walkers: Mall walkers do not tend to be walking for speed, so those who want to set a more vigorous pace may feel out of place. The recommended amount of physical activity to reduce health risks is 150 minutes per week of moderate-intensity exercise such as brisk walking, spread throughout the week in workouts of 10 minutes or more. This is easily achieved by walking at the mall or combining mall walking with other types of moderate-to-vigorous physical activity. To get a good mall walking workout, start at an easy pace to warm up for three to five minutes. Then pick up the pace so you are breathing harder than usual. Maintain this pace for at least 10 minutes at a time. You can also add intervals of higher intensity by taking the stairs or walking as fast as you can for 30 seconds to a minute. At the end of your walk, slow to an easy pace for a couple minutes. Some mall walking programs provide weights and exercise stations so you can also enjoy a strength workout after your walk. How Far Can You Walk in a Mall? The distance you can cover inside a mall in one loop depends on the size of the mall. Malls with walking program often post the distances you can achieve for different loops inside the mall. If you wear a pedometer or fitness tracker, it can estimate your mileage. You may discover that GPS distance doesn't register accurately inside a mall as the building shields the signal from the satellites. Your walking speed will determine how far you can walk before the stores open. Typical distances in 30 minutes would be 1 to 2 miles or 2,000 to 5,000 steps. Typical distances in 60 minutes would be 2 to 4 miles or 4,000 to 8,000 steps. Many malls actively encourage walkers in several ways. Often a walking club or program is sponsored by a local medical center. Membership is usually free and more information on joining may be found at the mall information kiosk or online. Walkers may receive a pin, T-shirt, or visor to identify them. The mall merchants might provide discounts, rewards for mileage achieved, and giveaways. Mall walkers may come for the exercise and stay for the friends they make. Having walking buddies can help you stay faithful to getting exercise consistently. Walkers get a jump on other shoppers as the stores finally open in the morning, a big advantage during the holiday shopping season. No wonder mall merchants support walking programs—they ensure loyal customers who return several times a week. Free blood pressure checks, low cost or free cholesterol screenings, and presentations by health and exercise experts are other perks for mall walkers. The mall walking club may even organize to take groups to charity walking events or other organized outdoor walks. Mall walking eliminates the common excuses for not exercising due to the weather, safety, and lack of walking companions. If these are your challenges, head to your local mall to give it a try. Belza B, Allen P, Brown DR, Farren L, Janicek S, Jones DL, King DK, Marquez DX, Miyawaki CE, Rosenberg D. Mall Walking: A Program Resource Guide. Seattle, WA: University of Washington Health Promotion Research Center; 2015.